Micropigmentation is the new and improved version of permanent makeup. Orlando micropigmentation is fast becoming one of the most popular beauty enhancement services within the beauty industry. Micropigmentation can help to restore the appearance of something that has diminished or been lost over time. It can also give a more youthful appearance to your face just by enhancing the eyebrows. About Face Design Teams Micropigmentation Specialists has helped many clients enhance their features by utilizing their professional micropigmentation skills. Do you struggle with your eyebrows? There are various reasons eyebrows can be so challenging. Eyebrows are seldom the same on both sides of the face. 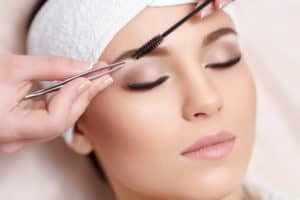 Furthermore, you may have thin or sparse eyebrows due to years of over tweezing or waxing. You may have experienced eyebrow hair loss due to a health condition. The reasons are as vast as each person’s DNA itself. The ability to achieve beautifully shaped, balanced and well-maintained brows should never be underestimated! Orlando micropigmentation specialists can help create better symmetry to the “arch rivals”! If you are tired of spending too much mirror-time filling your eyebrows in daily, you are not alone. There is hope and a long-term solution to improve your eyebrows! The daily grind of penciling, powdering, gelling, and whatever other brow enhancing products you may be using is over! With Orlando micropigmentation services, you can achieve the eyebrows you’ve always wanted and dreamed of having. A micropigmentation specialist can help enhance your brows by filling in areas that really need to be filled in. Individual hair strokes, soft powder brow or a combination of techniques may be recommended for the best natural looking outcome to add density and fullness. You will have beautiful, natural-looking eyebrows that may last up to 5 to 10 years! That’s right, years of beautiful eyebrows that you wake up with and don’t have to fill in! How great would that be? Do you have questions or wish to learn more about micropigmentation and what About Face Design Team can do for you? Give us a call and let’s chat!